Drag & Drop Feature - One of the ways that input files can be added to the current project is to select them in Windows Explorer, and then do a "drag & drop" into QuickPIP's main window. File Menu - Enables you to start a new project, load a saved project, save the current project, load a template, add input files to the project, change project settings, create an output video file, save a snapshot of the current preview frame, and other options. Edit Menu - Allows you to use the "Undo" feature, paste an image from the clipboard into the current project as an Embedded Image, or change the "Snap to Grid" option. Help Menu - Takes you this product documentation, the About screen, or the Edition Upgrade screen. New / Open / Save Buttons - Starts a new project, opens a project file, or saves the current project. "Project Settings" Button - Changes project settings. "Show Timeline" Button - Shows the timeline view, which is primarily focused on dynamic Display Objects. "Create Video File" Button - Create an output video file from the current project. Preview Window - Displays a preview of the project at the current time index. Clicking on a visible display object in this preview window will select it in the list on the right. You can click & drag to move it, right-click to view additional options, and double-click to open the properties box. If moving a display object via the click & drag method, there is a "Snap to Grid" feature to help improve alignment; it can be set under the "Edit" menu. Full Button - Plays a full-screen preview. Time Seek Bar - Click or drag to seek to a different time in the preview. Time Index Display - Displays or sets the current preview time. click on it to change it. Project Length Display - Displays or sets the project's length. Click on it to set the desired length, otherwise the length will automatically be based on the input files in the project. The text will be colored blue if it has been manually set. Input Files Frame - Lists and controls input files in the project. Clips 1 - 4 will run concurrently by default. 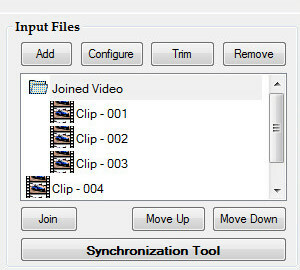 Clips 1 - 3 are joined together in a sequence called "Joined Video", which runs concurrently with Clip 4. Right-Click Feature - Displays a menu for the selected input file where you can create a display object and several other options. Join Button - Joins or un-joins the selected input files. Joining input files together effectively creates one single input stream from multiple input clips, in the order shown in this list. 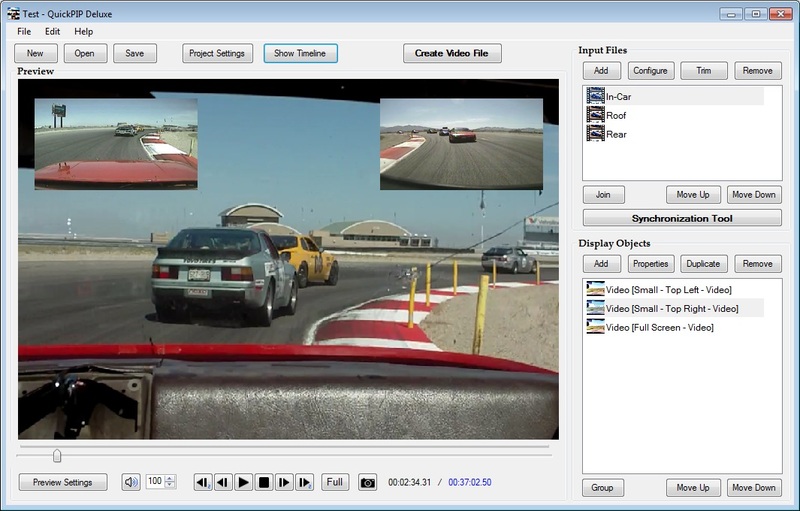 In other words, it acts much like a traditional video editor and connects the input files together sequentially, rather than having them play concurrently. You can then use the Move Up / Down buttons to change the clip order, and the Trimming Tool to set the length of each clip. 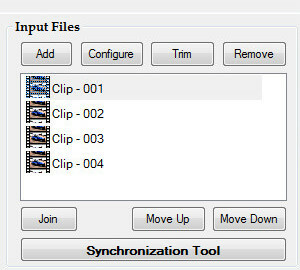 While input trimming and configuration is still applied based on each individual clip, most other functions and selections will only use the joined input object. Each join must consist of only video input files, or only audio input files. When a join is created, any file "Starting Offset" Time settings or related display objects may be removed. To add an input file to an existing join, select it and only the desired join object, then press the Join button. If you need to add a gap between input files in a joined sequence, right-click on a joined input, select Add Time Filler, and then move the newly created time filler object up to the desired position in the sequence. This will add a short delay between the input clips, which can be adjusted by selecting it and then clicking the Trim button. "Move Up" Button - Moves the selected input files(s) higher in the list. If they are within a joined input group, this will change their playback order. "Move Down" Button - Moves the selected input files(s) lower in the list. If they are within a joined input group, this will change their playback order. Display Objects Frame - Lists and controls display objects in the project. List is based on the drawing order, with top layer objects displayed at the top of the list. Right-Click Feature - Displays a menu of available options for the selected display object. Duplicate Button - Creates a copy of the selected display object and places it near the original. Group Button - Groups or un-groups the selected display objects. Grouped objects can be moved and re-sized together as if they were one unit. When grouping objects together, any timeline segments they currently have will be lost. New segments can then be created for the entire group. To add an object to an existing group, select it and only the desired group object, then press the Group button. "Move Up" Button - Moves the selected display object(s) to a higher drawing layer, causing it to be drawn on top of others. "Move Down" Button - Moves the selected display object(s) to a lower drawing layer, causing it to be drawn below others.